From Goodreads: Kelsey Finkelstein is fourteen and FRUSTRATED. Every time she tries to live up to her awesome potential, her plans are foiled - by her impossible parents, her annoying little sister, and life in general. But with her first day of high school coming up, Kelsey is positive that things are going to change. Enlisting the help of her three best friends - sweet and quiet Em, theatrical Cass, and wild JoJo - Kelsey gets ready to rebrand herself and make the kind of mark she knows is her destiny. Things start out great - her arch-nemesis has moved across the country, giving Kelsey the perfect opportunity to stand out on the soccer team and finally catch the eye of her long-time crush. But soon enough, an evil junior’s thirst for revenge, a mysterious photographer, and a series of other catastrophes make it clear that just because KELSEY has a plan for greatness ... it doesn’t mean the rest of the world is in on it. 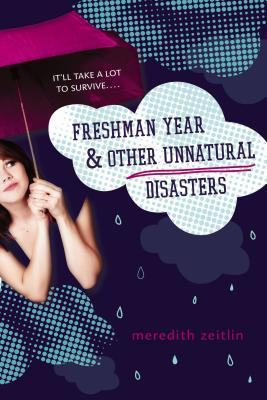 Thoughts on the Novel: Meredith Zeitlin’s Freshman Year and Other Unnatural Disasters was the perfect novel to lighten my mood when I was really stressed and get me out of my reading slump. A quick read filled with hilarious moments, this book features a narrator that’s incredibly easy to connect with as we’ve all been through what Kelsey has – trying to figure out our identity and how to leave a mark, having friendships change, falling in love, etc. I definitely encourage you to give Freshman Year and Other Unnatural Disasters a try, and dare you to read it without giggling! Freshman Year and Other Unnatural Disasters was released in March 2012 by G.P. Putnam’s Sons. From Goodreads: Twelve-year-old Emily is on the move again. Her family is relocating to San Francisco, home of her literary idol: Garrison Griswold, creator of the online sensation Book Scavenger, a game where books are hidden all over the country and clues to find them are revealed through puzzles. But Emily soon learns that Griswold has been attacked and is in a coma, and no one knows anything about the epic new game he had been poised to launch. Then Emily and her new friend James discover an odd book, which they come to believe is from Griswold and leads to a valuable prize. But there are others on the hunt for this book, and Emily and James must race to solve the puzzles Griswold left behind before Griswold's attackers make them their next target. Thoughts on the Novel: Book Scavenger by Jennifer Chambliss Bertman was a book that I decided to read because I loved its premise – hunting for and getting to keep books by having to solve puzzles! However, unlike some MG books which have crossover appeal, it was obvious that the target audience for this book were Middle Graders for two reasons: 1) Emily’s friend James names his cowlick and almost treats it like an imaginary friend, which was annoying to read about as an older reader, and 2) the villain of the story was quite predictable and you knew that the characters were never in any danger from him. Book Scavenger was released in June 2015 by Henry Holt and Co. I could go for a funny, light hearted read right about now, myself so I'm definitely going to try Freshman Year. I have a copy of Freshmen Year but I haven't gotten around to it yet. Glad to hear that you enjoyed the book. Book Scavenger is also on my tbr. While a predictable villain always bums me out, I'm still willing to give this one a shot. It just sounds too cute to pass up. You have me sold on Freshman Year and Other Unnatural Disasters, as stress and reading slump is what I'm frequently getting into with my new job. Great mini review! lol I wish I had a cowlick as an imaginary friend. Not. But the first one really does sound like a lovely, feel-good read! Ohhh, Freshman looks so cute!!! I am glad you enjoyed it, and it helped you out of your reading slump. It's to bad Book Scavenger didn't work out for you. Next time.